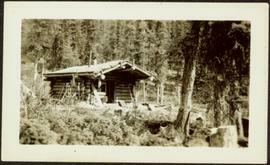 Photograph depicts a log cabin with sod roof in forest clearing. Handwritten annotation on recto of photograph: "Sayer Creek." 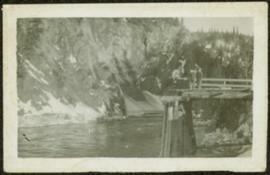 Photograph depicts two unidentified men standing on wood walkway extended high above water. Cliffs in background. Photograph speculated to have been taken at Sayer Creek, B.C.